As we move into June an increasingly diverse range of fruit and veg begins to come into season, settling in for the summer ahead. Apricots, blueberries, cherries, beans of all types, artichokes, aubergines; you name it, it’s probably going to be available soon and at an attractive price. The same, of course goes for raspberries, which should be around until early October. But there’s nothing wrong with getting on the bandwagon early. 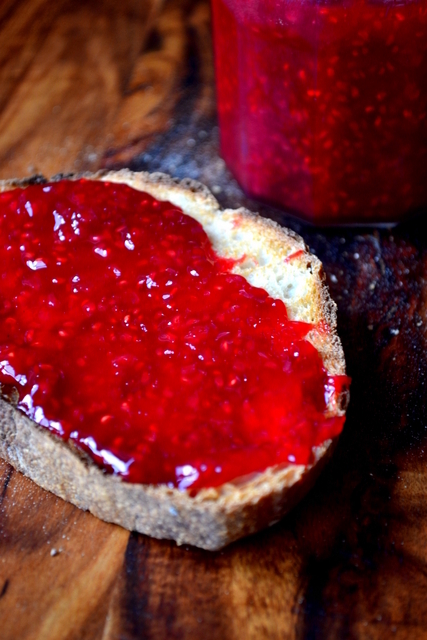 Get preserving and try your hand at making Raspberry Jam. I confess, fresh raspberries do nothing for me; they’re furry and tart almost to the point of being unpleasant. But cook them down – ideally with a sprinkling of sugar – and their gorgeous berry flavour is accentuated. Suddenly, they become one of my very favourite summer fruits. As with any jam, using the correct amount of sugar is vital. Use too little and the tartness of the raspberries is overpowering; use too much and it’ll be altogether lost. 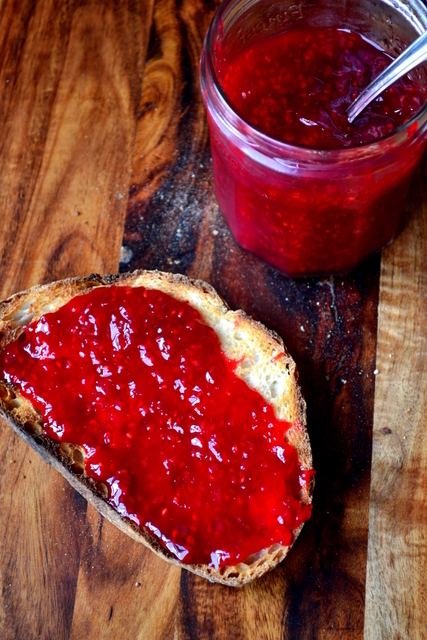 Equal parts sugar and fruit generally yields a jam that’s too sweet. Instead, a ratio of 3 parts fruit to 2 parts sugar works well in the case of raspberries, producing a well-balanced, soft-set jam. 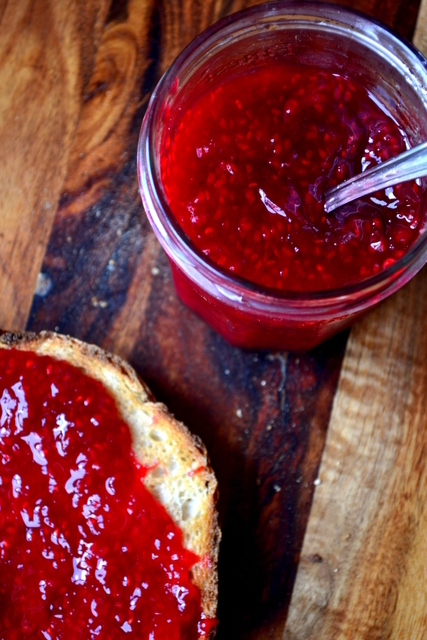 Whether you keep the hundreds of tiny little seeds in your batch of raspberry jam is entirely up to you. My preference is that they remain. 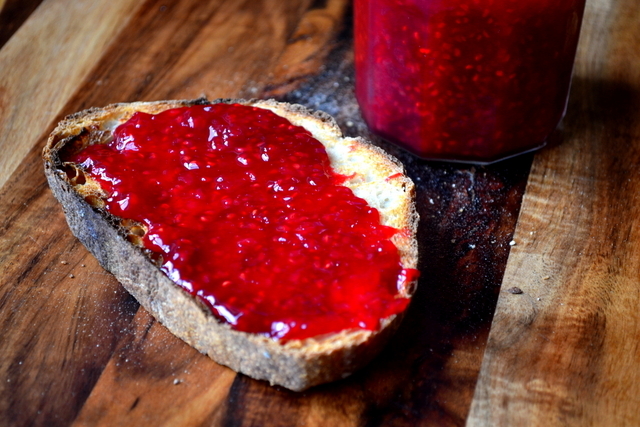 Not only does it make the preserving process simpler by far, it makes for a more interesting jam worthy of even the finest slices of sourdough bread. Be prepared, however, to pick the odd seed from between your pearly whites. Tip the raspberries – making sure they’ve been washed – into a large saucepan, along with the jam sugar and lemon juice. Place 2 small plates in the freezer and sterilise three jam jars with boiling water. Gently heat the fruit over a low heat until the sugar has completely dissolved. Bring the fruit to a brisk boil, skimming off any pink scum that forms. After 7 minutes of boiling take a small amount of the jam and place it on one of the chilled plates. Once a minute has passed push the cool jam with your finger. If the surface of the jam wrinkles then it’s ready. If not, give it a few minutes longer and try again. When ready, transfer the jam into the two sterilised jars, seal and leave to cool. Once open, store the jam in the fridge, where it’ll last for many months. Cost: Now in season, the price of raspberries will be relatively low for the next few months. At my local grocer they are currently available for £1.50/250g, a very tempting offer. As such, the three jars this recipe yields should set you back no more than £4.50. Last summer I picked a bunch of fresh raspberries and they were amazing. This year, I’m going to go back to the same farm and pick twice (maybe three times!) the amount of raspberries so that I can make some jam to get me through the winter months! Yes – jam away. I’m always making the stuff, but we’re always eating it! Your vibrant raspberry jam on that crunchy-edged bread on a lovely wooden cutting board prove that the simple things in life are the finest. Thanks! Indeed they are 🙂 – my pleasure. I love jam on just about anything! Or in a few things, too! Me too – I really love making jam! I love raspberry jam and yours look so tasty! I just made a strawberry jam to put over yogurt. Love it this time of year. This raspberry looks excellent! Yes – I’ve done a lot of putting jam on yoghurt – I like mixing it in, you get such wonderful colours.